On March 19th I had the pleasure to present Stelarc with the Australia Council Outstanding Achievement Award for Emerging and Experimental Arts. Bringing individual art form awards together for the first time, the inaugural 2015 Australia Council Awards combine long-standing lifetime and significant achievement awards in music, literature, community partnerships and visual arts, with new awards in theatre, dance, and emerging and experimental arts. The award ceremony was held at the Carriageworks Sydney and Stelarc was overjoyed to receive the award. As one of Australia’s most distinguished artists working in the field of art and technology, it was a real privilege to present Stelarc with this award in my role as Chair Emerging and Experimental Arts Australia Council. 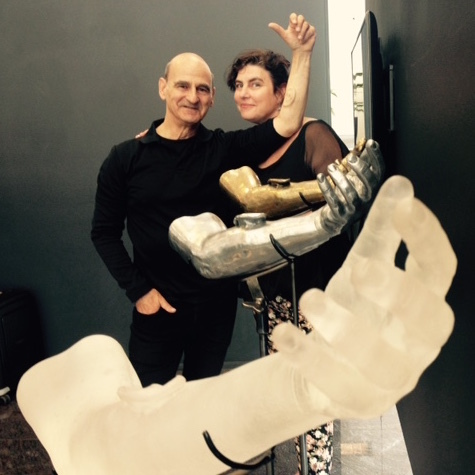 Stelarc with Julianne Pierce at the Australia Council Awards exhibition.